I have had my sights on breaking into the art and historical locations side of 3D tours in my market because I know that this technology has a bright future in areas other than just real estate. 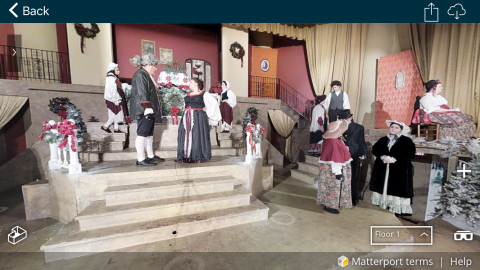 I was inspired by the scan I saw of a blood bank with people staged throughout and I approached a local Christian Theatre group about scanning the theatre with the cast in position to help promote their Christmas production that opens tonight and also cross promote my services. I told the cast they were part of a science experiment since I had never scanned a space this large with a bunch of live people in it before. I explained that it would be the most boring 30-45 minutes of their lives, however, the finished product would be worth the hassle. I'm working on it in Workshop now, but I wanted to share a couple of screen caps of the initial views from the app and let you guys in on what I was up to. From a publicity standpoint I realized how big this would be when the cast huddled around me after the scan and were in awe of some of the home tours I was showing them on the iPad. They had asked how it would look and I was explaining what the finished product looks like. Now, when the theatre posts the tour, I will have a small army of people tagging, sharing and talking about the tour and word will get out faster than if I were just doing a home that has one or two owners. I'm really excited to see how this goes over in my market. I'll share the link when I publish it. Good luck. Maybe you'll make the news and the news people will mention your website which leads to inquiries that result in jobs. 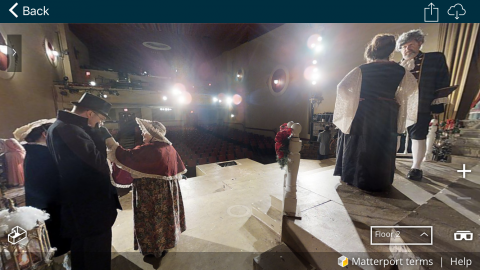 If the theater has a Facebook page you could post a 360 on it. 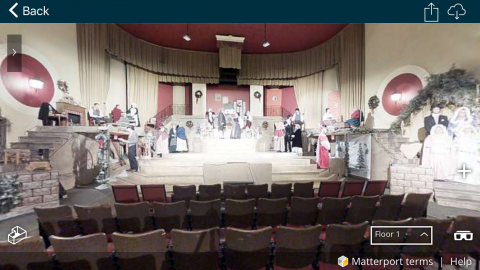 Lots of businesses put 360 images there that you explore right on the page. Facebook 360 images also appear in Gear VR when you launch the 360 Photos app. Some businesses with Facebook 360 photos also put their URLs and contact info below the image. That makes the photo a marketing tool that can get liked, shared and pasted around through the Facebook universe. If you see a Facebook 360 photo while wearing a Gear VR, the only way to "save" or remember it is to tap a share or like button. When someone does that, the picture also appears on the real Facebook page where everyone can see it. I'ave seen all types of businesses put their URL and marketing blurb beneath these photos. Since by default you have 360 images, you might as well put them to work. I'd like to see your CoreVR model. I've only seen one that had people and it might have been that blood bank model. It seemed to work out alright. I love seeing 'life' in MP scans. It's one of the aspects that is missing in models where you expect to see people around. Well done! Totally wicked - like it a lot.... first time i've seen such an approach taken. How much did you need to bribe the cast with ? Tosolini & Kevshed, Thank You Both! Well done on a great final product and for having the kahunas to arrange it firstly and then get them all to take part! Amazing things can be done if the mind is diverted away from real estate. That is really great! So much fun to look through! Kudos!! Baxter & Lisahinson, thank you for the encouragement!